With the May numbers reported today payroll employment has officially surpassed the pre-recession peak of 138.365 million, by 98 thousand. 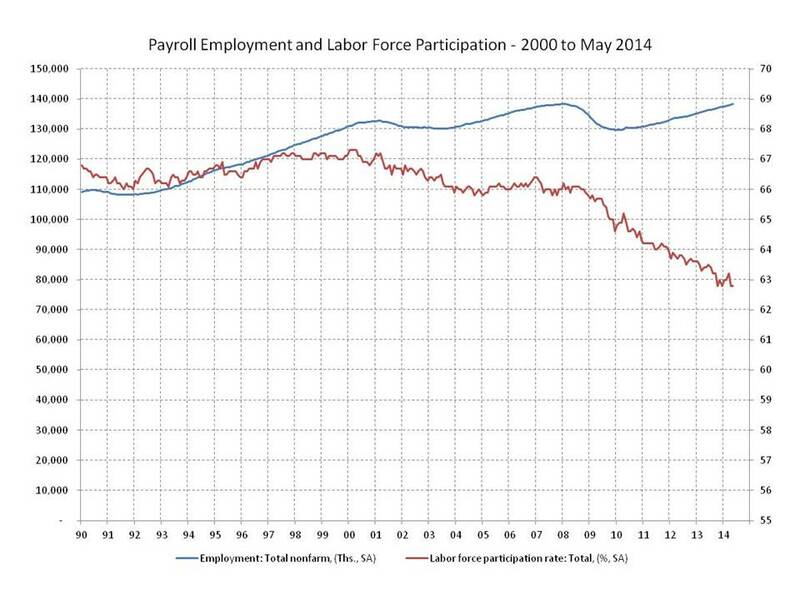 The Bureau of Labor Statistics (BLS) released the Employment Situation report for May. The establishment survey showed payroll employment expanded by 217,000. The April figure was revised down by 6,000 and the March figure was unchanged. From the household survey, the unemployment rate held at 6.3%, but the addition of 192,000 to the labor force put some welcome upward pressure on the rate. That’s a good thing. Most analysts agree the unemployment rate overstates the health of the labor market because the labor force participation rate has declined significantly since the recession began and has yet to recover. The Federal Reserve abandoned the 6.5% threshold for the federal funds rate in recognition of this disconnect. At this point a very positive (and much anticipated) labor market development would be for payrolls to continue expanding at a pace of at least 200,000 per month and the unemployment rate to hover at the current level (if not increase) as discouraged workers return to the labor force. Passing the pre-recession peak is an accomplishment but with a depressed participation rate and still elevated levels of long term unemployment and under-employment there is still plenty of room for improvement. The unemployment rate plunged to 6.3% in April from 6.7% in March. But curb your enthusiasm, it’s not what you think. First, the numbers. The Bureau of Labor Statistics (BLS) released the Employment Situation report for April. The establishment survey showed payroll employment expanded by 288,000, and February and March were revised upward for a combined increase of 36,000. The gains were broad based. 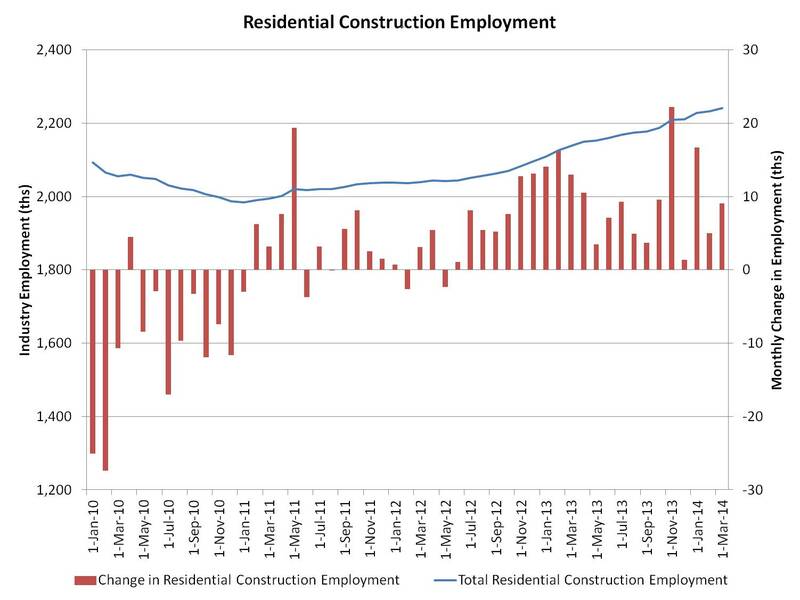 Residential construction added 13,100 jobs, bringing the total number of jobs added since the beginning of 2012 when the housing recovery began in earnest above 200,000. From the household survey, the unemployment rate dropped to 6.3% from 6.7% in March. But as has frequently been the case in this recovery, the decline was not due to an increase in the number of employed persons, but from a decline in the labor force. The number of employed persons actually declined by 73,000, but this loss was overwhelmed by a decline in the labor force of 806,000. If the labor force didn’t shrink and the 73,000 job losers were counted as unemployed, the unemployment rate would have risen to 6.8% instead of declining to 6.3%. So the labor report is mixed, and context is important. The 288,000 addition to payrolls is definitely encouraging. Payrolls are now “only” 113,000 below their January 2008 peak and likely to surpass that mark in the next month or two, but that’s just making up six years of losses. And while the unemployment rate is at the lowest point since September 2008, the progress has been heavily dependent on labor market defections, like those in April, in combination with job gains. This overstatement of labor market improvement in the current unemployment rate is why the Fed has recently abandoned its 6.5% threshold for considering raising short term interest rates. We’re there and the economic recovery is far from complete. On the other hand, the gain in payroll employment supports the Fed’s optimism regarding the economy going forward, and the decision to continue winding down its asset purchasing program, announced following its monetary policy setting meeting last week. The Fed’s policy configuration, balancing accommodation to support a continuing but unfinished economic recovery, is a reflection of the complexities in Friday’s labor report: positive signals on the surface but a more complicated picture underneath. 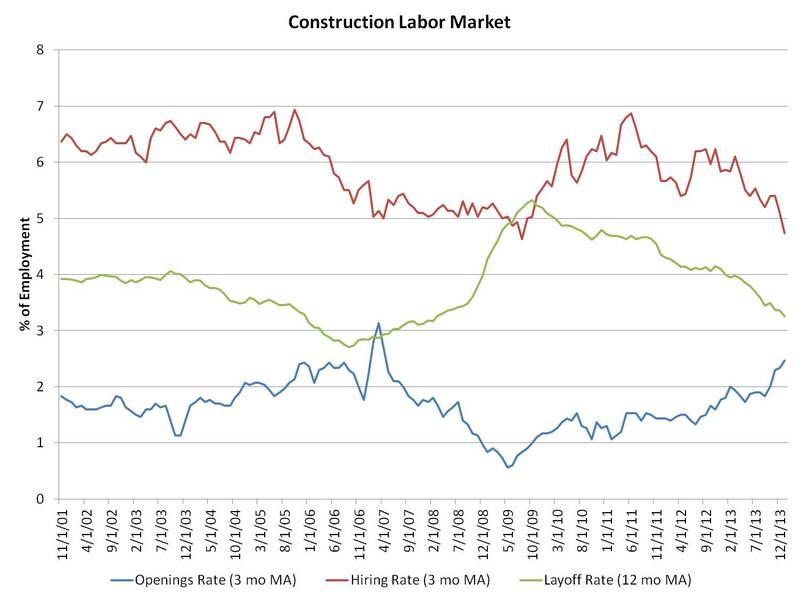 The number of open, unfilled construction sector jobs declined at the start of 2014, according to the BLS Job Openings and Labor Turnover Survey (JOLTS). While the February open rate is the fifth highest since the end of the recession, the count of open construction jobs fell during a period when unseasonably cold weather took a toll on numerous parts of the economy. For the construction sector, monthly gross hiring declined slightly, falling on a seasonally adjusted basis from 281,000 to 273,000 from January to February. Over the same period, the hiring rate, as measured on a 3-month moving average basis, fell from 4.7% to 4.5%. Measured as a three-month moving average, the construction openings rate (the blue line above) has declined since December, inclusive of a significant downward revision for the preliminary January data. As of February 2014, the three-month moving average stood at 2%, a rate higher than any data reporting prior to October 2013 but lower than the December 2013 peak of 2.33%. 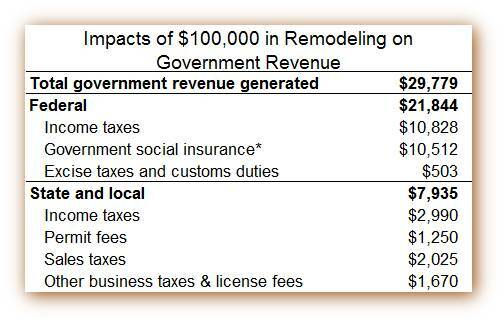 Two other changes in the construction sector are worth noting. First, the layoff rate for the sector (graphed above as a 12-month moving average) has continued to fall. Second, the sector hiring rate has fallen noticeably since the fall of 2013. The trend lines over the last two years – a falling hiring rate, an increasing opening rate, and a declining layoff rate – are consistent with some construction firms having trouble contracting with workers for specific projects. However, future employment reports will indicate whether recent hiring weakness is mostly due to weather effects or reflects new baselines for construction activity. Monthly employment data for March 2014 (the employment count data from the BLS establishment survey are published one month ahead of the JOLTS data) indicate that total employment in home building stands at 2.242 million, broken down as 650,000 builders and 1.592 million residential specialty trade contractors. 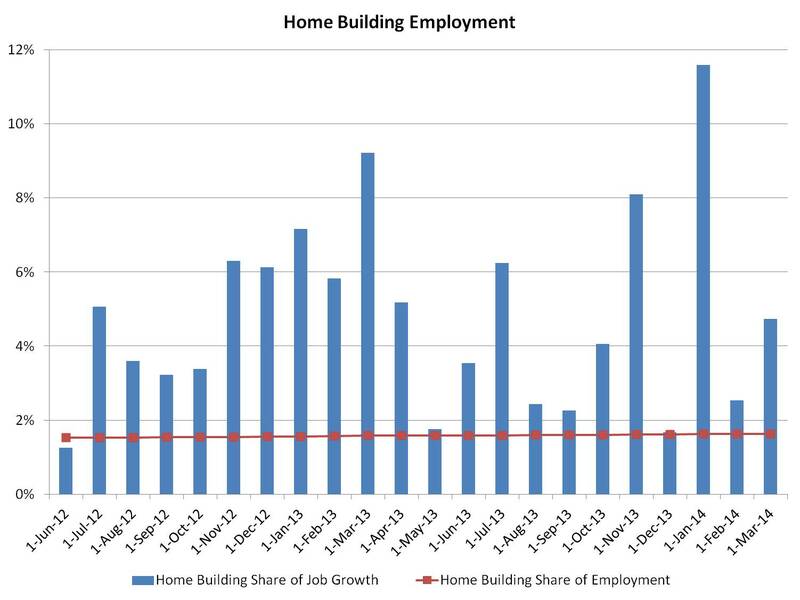 According to the BLS data, over the last year the home building sector has added 103,000 jobs. Since the point of peak decline of home building employment, when total job losses for the industry stood at 1.466 million, 257,500 positions have been added to the residential construction sector. As of March, over the last six months the home building and remodeling industry has added on average more than 10,000 jobs per month. For the economy as a whole, the February JOLTS data indicate that the hiring rate was constant at 3.3% of total employment. The hiring rate has been in the 3.1% to 3.4% range since January 2011. The current overall job openings rate (2.9%) has been in the 2.7% to 2.9% range since the start of 2013. Solid job growth for home builders and remodelers was recorded in March, according to data from the Bureau of Labor Statistics (BLS). The residential construction industry added 9,100 jobs for the month on a seasonally adjusted basis, 3,100 working for builders and 6,000 residential specialty trade contractors. Total industry employment now stands at 2.242 million, broken down as approximately 650,000 builders and 1.592 million residential contractors. 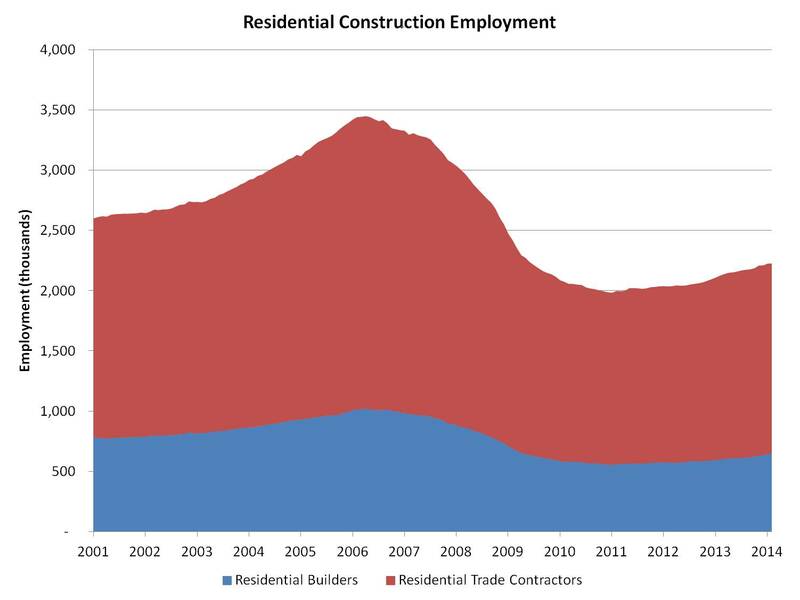 For 2014, the residential building industry has been averaging 10,000 jobs created per month. Over the last year, 103,000 jobs were created, and the home building workforce has gained 257,500 jobs since the post-recession low point set in January 2011. Over the last year and a half, the share of jobs being created by the sector has outpaced the share of industry employment. For example, in March 2014, industry employment represented 1.63% of total nonfarm jobs. However, residential building was responsible for 4.74% of total jobs created. Home building typically provides an outsized boost to economic growth and job creation as a recession ends. In the last year or two, home building has finally assumed this typical economic role. Overall, the establishment survey from the BLS indicated that 192,000 jobs were created on a seasonally adjusted basis in March. This was slightly below expectations, but on net a positive indicator for the economy. 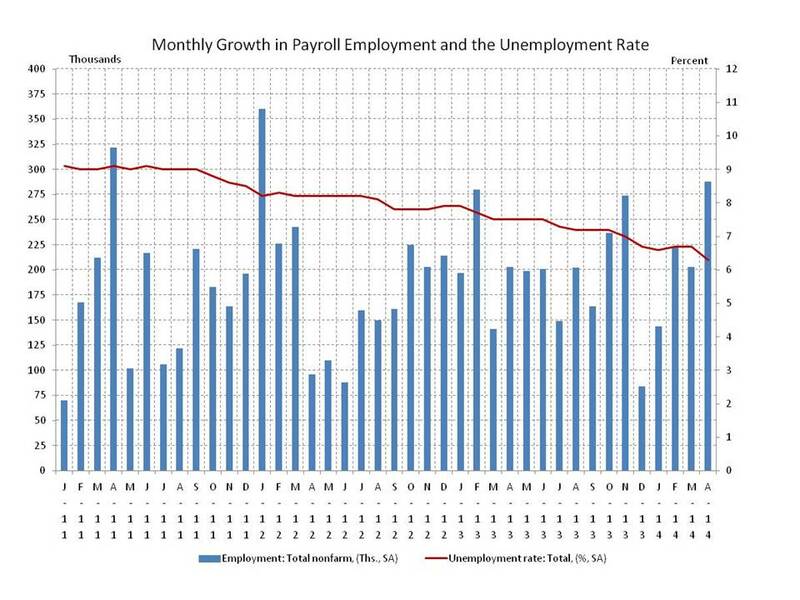 Previous months reporting was also revised up by 37,000 jobs. The March data is also consistent with the claim that unseasonably cold weather in much of the U.S. held back economic growth during the end of 2013 and the start of the new year. The separate household survey reported that the unemployment rate held steady in March at 6.7%. In a positive sign for household formations and housing demand, the labor force participation rate increased 0.2 percentage points to 63.2%. The size of the labor force increased by 503,000 in March.